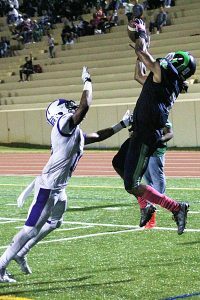 Quarterback Bryson Williams threw for three fourth quarter touchdowns and ran for another to rally the Arabia Mountain Rams from a 28-8 third quarter deficit to a 36-28 Region 5-5A victory over the Miller Grove Wolverines at Hallford Stadium on Friday night. 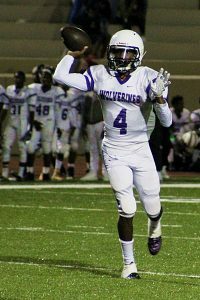 Miller Grove appeared to be on the way to tying the all-time series at 2-2 when Jamaal Roach connected with Jalen Stuckey on a 22-yard pass to the end zone for the touchdown for a 28-8 lead with 1:13 to play in the third quarter. Williams and the Rams (4-2, 1-0) started their comeback on the ensuing drive with Williams connecting with Tyler Suber for an 11-yard touchdown pass with 11:20 to play in the game to pull Arabia Mountain within 28-16. Joshua Campbell’s reception down the middle of the field from Williams went for 54 yards to help set up the touchdown. Williams connected with Campbell for the two-point conversion. Arabia’s Amir Graham recovered a fumble at the Wolverines’ 21-yard line on Miller Grove’s first play following the kickoff to set up the next score for the Rams. Two plays later Silas Butler made a leaping catch on the left side of the end zone and came down in bounds to pull the Rams within 28-24 with 10:53 to play. Campbell’s two-point conversion closed the gap to four. The two teams traded bad snaps with the Rams coming up with the ball on the Wolverines’ 21 again as punter Jalen Stuckey had to track down and fall on an errant snap on fourth down. A 14-yard pass from Williams to Suber set up a two-yard run by Williams for the touchdown and Arabia’s first lead since it was 8-6 with 7:58 to play in the first quarter. The two-point conversion try was stopped for a 30-28 Rams’ lead with 3:43 to play in the game. The Rams sealed the victory as they forced a turnover on downs at the Miller Grove 27 and Williams hit Butler for their third touchdown combo of the night on a fourth and three at the Miller Grove 20 with 1:16 to play. The point after try was no good. Campbell crushed any hopes of tying score by the Wolverines (3-3, 0-1) with an interception as time ran out. Williams, who was 18 of 31 passing with one interception and four touchdowns for 289 yards, opened the scoring with a 43-yarad touchdown over the middle to Butler. Campbell ran in the two-point conversion for the 8-0 lead with 8:07 left in the first quarter. Miller Grove answered quickly with an 80-yard kickoff return by Geon Floyd to pull within 8-6. Miller Grove would take a 20-8 lead into the half as Keshawn Varner’s interception set up a two-yard score on a sneak by Roach. Roach made it 20-8 with 34 seconds left in the half on a 22-yard touchdown pass to right front corner of the end zone. The Columbia Eagles scored 20 unanswered points for a 26-7 Region 5-5A opener victory over the Lithonia Bulldogs on Friday night at Avondale Stadium. Trailing 7-6 heading into the second quarter the Eagles (4-2, 1-0) scored twice in the second quarter to take an 18-7 lead into the half. Columbia took the lead for good with a 13-yard scoring toss from Tremaine Calloway to Quintavious Boykins with 6:41 left in the first half to go up 12-7. Three minutes later the Eagles benefitted from a Lithonia fumble with Rondarious Bryant cashing it in on a two-yard run into the middle of the line to make it 18-7 at the break. Columbia salted the game away towards the end of the third quarter as Calloway threw his third touchdown pass of the game, this time to Gregory Morris. The two-point conversion was good as the Eagles took the 26-7 lead into the fourth quarter. The Eagles’ defense played tough throughout the game allowing just the one big play, a 94-yard touchdown pass from Lithonia’s Foday Tarawally to Kevah Brantley to end the first quarter. Columbia had taken the early lead of 6-0 on a Calloway to Geovanni Dyer touchdown pass with 7:55 left in the first quarter. 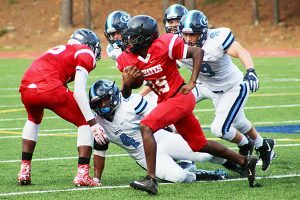 The Stone Mountain Pirates battled, but the Lovett Lions had too much firepower on the way to a 50-0 Region 5-3A victory at Hallford Stadium on Friday night. Stone Mountain (1-5, 0-3) had a big interception just before the half to stop the Lions from adding to a 36-0 lead. Quarterback Shaheim Bailey had runs of 10 and 12 yards and long pass of 15 yards to Jabez Long to lead the Pirates. Long also had an exciting 24-yard kickoff return that almost turned into a touchdown.